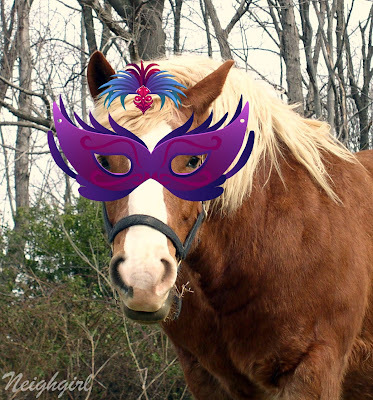 Wendell was all dressed up for Mardi Gras. He was particularly interested in the Fat Tuesday Pancake Supper. We didn't think the people at church would be ready for our silly boy to make an appearance, so he didn't get to go. Should we tell him that St. Patrick's Day is just around the corner? Hee-hee, what a festive steed! Is he sleeping off a hangover this morning on this fine Ash Wednesday? How cute is Wendall! My church would have loved for him to show up. Cute...I think he should have gone! Pippin would have loved pancakes too. Love the 'costume'! Clever Wendall! Glad to see Wendell participated a bit in the festivities! Absolutely!! Tell him about St Patrick's day ~ and then give him a "Kiss Me I'm Irish" sign and hide in the bushes with a camera! !